As a leader and an expert in the flooring industry, Surface Solutions has been installing resinous flooring surfaces for over 30 years. We enjoy partnerships with the best manufacturers of specialty resin flooring in the industry as well, like BASF-Selby/UCRETE, Sherwin-Williams, and Flowcrete. 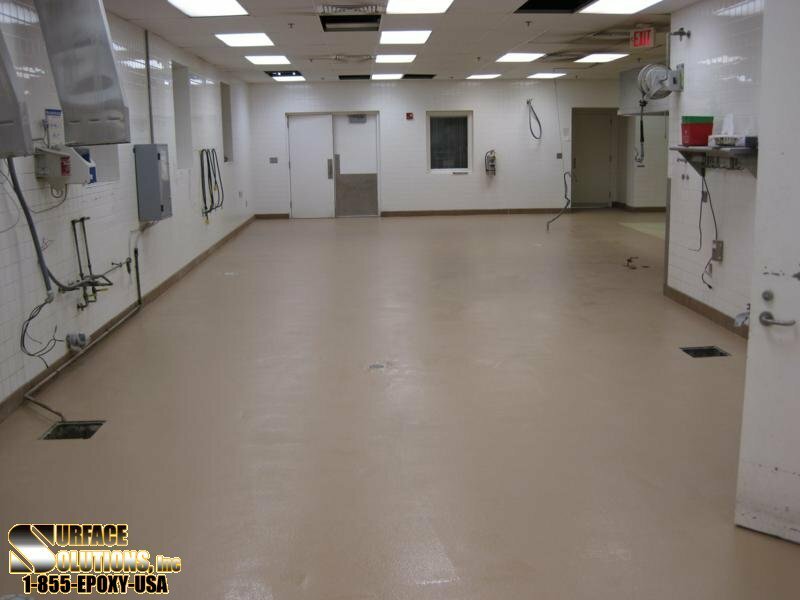 Resinous flooring from Surface Solutions consists of applying a base of resinous material to concrete, creating a smooth, non-porous flooring surface. Used in new construction as well as remodeling projects in commercial and industrial facilities, resinous flooring is cost-effective, durable, meets a variety of safety and overall performance standards as well as aesthetic design goals. Polyurethane -Polyurethane polymers are formed by combining two bi- or higher functional monomers. Acrylic (MMA) -Acrylic resin is a general term for any one of the plastics generated through chemical reaction by applying polymerization initiator and heat to a monomer. Methyl methacrylate (MMA) is a transparent, colorless fluid substance that must be properly ventilated during application. Low-cost –compared to terrazzo, high-grade carpeting, VCT, rubberized terrazzo and non-formulated vinyl. Surface Solutions provides expert consultation and installation, and a full line of resinous flooring solutions in addition to other industrial flooring systems. We are committed to 100% customer satisfaction on every project. After working with them for over five years, this custom glass manufacturer counts on Surface Solutions to recommend and install high performance flooring at their facility in Maryland. Our expert flooring specialists remove the existing coatings from a 12,000-square-foot warehouse and install a 3-coat epoxy system to 30 mils, followed by SS321, a urethane topcoat….